BP-888Plus: 3.7 volt 2800mAh Li-ION battery for Baofeng BF-888S BF-777 etc. 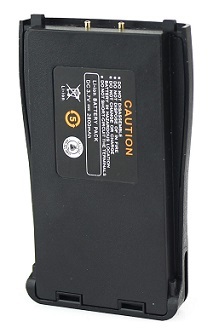 Home > Ham Radio > Battery Packs > BP-888Plus: 3.7 volt 2800mAh Li-ION battery for Baofeng BF-888S BF-777 etc. BP-888Plus: 3.7 volt 280mAh rechargeable long life Li-ION battery for Baofeng BF-888S BF-777S, BF-666S, H777,etc. Extra hig capacity battery, providing longer operating time and high-watt transmit. Can be re-charged in the stock desk charger. Pricing is for one battery pack. SALE PRICE $ 9.95 ea. BP-888: 3.7 volt 1500mAh Li-ION battery for Baofeng BF-888S BF-777 etc. BP-888: 3.7 volt 1500mAh Li-ION battery for Baofeng BF-888S BF-777S, BF-666S, H777,etc. 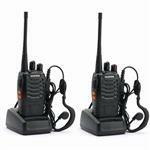 BF-888S: 2 Radios in Package; Baofeng Walkie Talkies, 5-Watt, 16 channel, NO license required ! Transmit & Receive in UHF range. Pkg includes, 2 radios, 2 batteries, 2 desk chargers, 2 ear-mics, 2 antennas, 2 lanyards, instructions.